Do you want to become a Brilliant Speaker? Do you want to become a more Compelling Communicator? Do you want to become a Mesmerizing Messenger? Improve your Speaking, Interviewing, and Business Writing skills! We provide keynotes, interview coaching, workshops, language coaching, and other full cycle career services. Whether you’re just starting out and need to polish your interviewing skills, or you’re a seasoned veteran who wants to make that killer presentation to get noticed, we can help you shine. they are going to matter even more in the future. Buy Necessary Bridges. Read preface & chapter 1. Start writing down your life story. Read chapters 2 & 3. Name your project. Create a PROJECT CHARTER. Read chapters 4 & 5. This completes the basics. If you want to work further with me, this is a good starting point. Send me your project charter. Schedule a 30 minute consultation. (introductions + your life story = 15 minutes: your project charter review + next steps = 15 minutes) Contact me, or call me. + 1 832 728 6886. 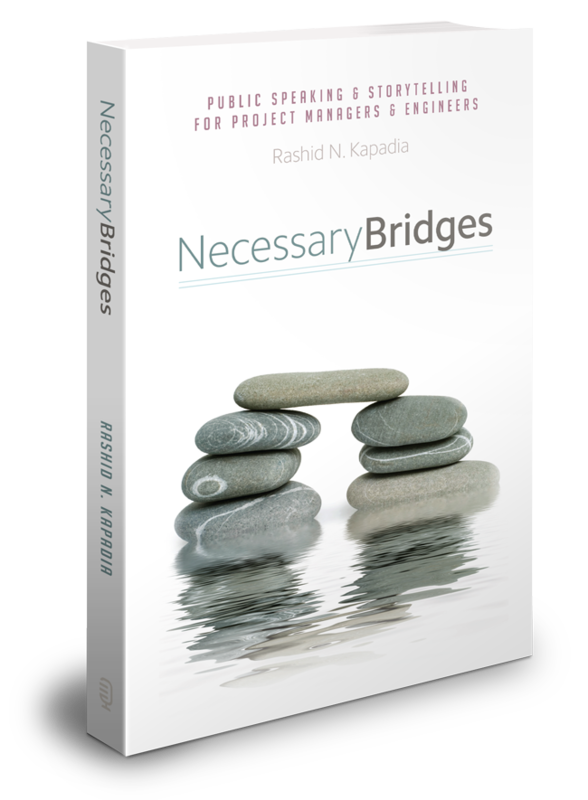 Necessary Bridges is an excellent, dare I say indispensable, book for anyone who is or aspires to be a project manager, engineer, accountant or scientist. Kapadia is a gifted writer and speaker. His goal is to enable and ennoble those who aspire to succeed in the STEM based vocations. This book is a specific how-to, owners manual for speaking success. I enjoyed every page and learned a great deal. It is the best book I have ever read on the subject. P.S. I have been speaking professionally for over 20 years. Human Performance (individual and team) tips series. A tip from a Book series. Key Phrase. “You Must Make A Contribution”. The HP Way.